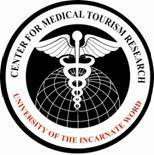 The Center for Medical Tourism Research (CMTR) is located in the H-E-B School of Business & Administration at the University of the Incarnate Wordin San Antonio, Texas. This is the world's premier academic research center devoted to medical tourism / travel research. The center's founder and Director is David George Vequist IV, Ph.D. who is regarded as one of the leading academic speakers and authors on the industry of medical tourism / travel. To serve as the premier academic center for Medical Tourism/Travel research in the world. The center will provide high-quality research and thought-leadership in the economic, social justice, and societal impacts of the Medical Tourism/Travel industry. The center will also uphold the Mission of the University of the Incarnate Word: Faith; Service; Innovation; Truth; and Education. The center is aggressively pursuing primary data and accumulating secondary data to support the development of thought leadership, best practices, lessons learned, and policy formulation in the new industries of Health Tourism, Wellness Tourism, Dental Tourism, Medical Tourism, and Retirement Tourism. As part of its purpose, the center will supply stakeholders around the world with leading edge research and the truth about the impacts of this trend on the countries, companies and people involved in this industry through the Center's websites and papers.